VXG Player SDK is a set of tools for fast and convenient development of mobile applications for viewing various media streams like RTMP, HLS, RTSP, RTP, MMS, WebM, FLV, MP4, TS, and other network video formats and playback files with following formats: AVI, MOV, MKV, FLV, AVI, 3GP, 3G2, ASF, WMV, MP4, M4V, TP, TS, MTP, M2T, etc. 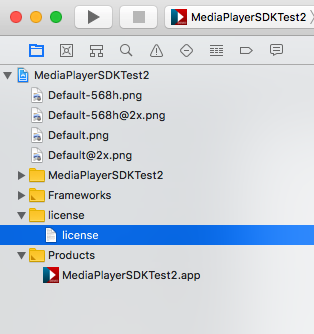 The core of the SDK is a library for application development. Hardware acceleration – a new hardware accelerated decoder for HD video. Multi-core decoding – support of the multiple processor cores for decoding. Multi-channel support – simultaneous connection to multiple resources or multiple video channels and simultaneous video decoding. Video integration with any Activity – is based on SurfaceView and can be integrated with any Activity. Hardware pre and post video processing – hardware de-interlacing and various pre and post video processing using OpenGL shaders. Custom and standard notifications – notifies application about connection, disconnection and other events. It is possible to add custom events. Smart and online thumbnails – quick and simple API to get thumbnails for local files and network streams. Low latency for network stream – special API to control playback latency. Live streams recording – special API to record streams into mp4 file. Audio and Subtitle control – special API to control audio and subtitle tracks during playback. Audio pitch correction on changed rate – the filter added for correcting the intonation of an audio signal without affecting other aspects of its sound when playback rate has been applied. This is not required for evaluation and testing. It’s required only after purchasing a license in order to remove evaluation version limitations. Step 2: Create an empty file license in your application and paste your license key into this file. See the picture below how it should look in corresponded test applications streamland_player. Providers notifies about results, errors and notifications using “MediaPlayerCallback” callback. All messages are synchronous and provider waits until the application handles a message. 108 CP_RECORD_STARTED NOTIFICATION CP notifies that recording started and new file has been created. Call player.RecordGetFileName(1) to get name of file. 109 CP_RECORD_STOPPED NOTIFICATION CP notifies that recording has stopped and the file has been finished. Call player.RecordGetFileName(0) to get name of file. 110 CP_RECORD_CLOSED NOTIFICATION CP notifies that recording is closed. 111 CP_BUFFER_FILLED NOTIFICATION CP notifies about pre-buffering process is completed. 112 CP_ERROR_NODATA_TIMEO UT NOTIFICATION CP notifies that no data had came for DataReceiveTimeout period. Application registers single callback function via Open (config, callback) call. 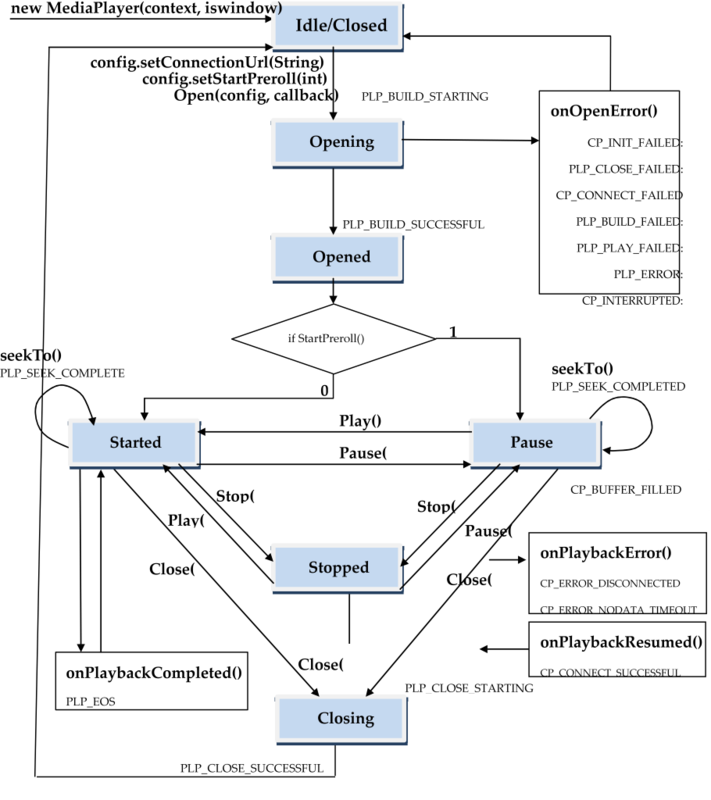 State diagram separates notifications into 3 groups: onOpenError(). Occurs when error has happened in Open() function. onPlaybackError(). Occurs when error has happened in one of Paused/Started/Stopped states. * onPlaybackCompleted(). Occurs in Started state only when end-of-stream has reached. In case onOpenError() the closing procedure is processed automatically, i.e. MediaPlayer goes to Closed state. In case onPlaybackError() / CP_ERROR_DISCONNECTED the closing procedure is not processed automatically, pipeline state is not changed, but in order to do further playback the application must close pipeline Close() before Open() pipeline again. seekTo() is processed by either setStreamPosition() or setLivePosition() in Started or Paused states. In case if result of setStreamPosition() or setLivePosition() is equal to 0, the notification PLP_SEEK_COMPLETED will be. In case onPlaybackCompleted()/PLP_EOS happened, the state of pipeline is not changed. CP_BUFFER_FILLED notification received in Paused state indication that pre- buffering has finished. getStreamPrebufferTime() function returns the time position of pre-buffered data. seekTo() up to the pre-buffered position doesn’t require network connection. Following functions are members of MediaPlayer class. These functions should be used to playback network content and media files. Connect to network server or open media file, create pipeline and playback media data. Connect to network resource or open local media file, create pipeline, allocate resource and start video playback. drawNumberOfFramesAndPause – how many frames will be played before pause. Currently the following value is supported only - drawNumberOfFramesAndPause:1 – draw one frame and pause. Resume play if player is in Pause state. This function can be used with playback from files only. Pause playback if player is in Play state. This function can be used with playback from file only. Change playback state from Play to Stop. Stop playback if player is in Play state. Provide the current state of player. Return duration of media file in milliseconds. This function works only in case of file playback. Upon successful completion, getStreamDuration() returns file duration in milliseconds. Otherwise -1 is returned. All errors are provided in callback status. Provides duration of the file played. Get position in played media file. This function works only in case of file playback. Upon successful completion, getStreamPosition() returns current position of played file (in milliseconds). Provides the played file position. Set position of played media file. This function works only in case of file playback. Provides the position of played file. Function provides current, first, and last positions for live stream. This function works only in case of live stream playback (HLS). first - dts of first segment in m3u8 list last - dts of last segment in m3u8 list current - dts of last downloaded packet in HLS stream duration - stream duration stream_type - stream type finished file or live stream Time base is milliseconds. True - on successful completion, Otherwise – error result. Provide the current, first, last positions in played stream. Change position of played live stream. This function works only in case of live stream. Change the position of life stream played. Change speed of playback for local file and network stream. No value is returned by function setFFRate. Change speed of playback for local file and network stream. Important note: Some data is skipped if rate is less or more than normal playback rate. Capture video picture from video stream. Video format is RGBA32. 0 - ok, (-1) - error, (-2) - need more buffer space for image. Provide the video shot of last render frame in format ARGB_8888. Function provides last position in played media file or stream. Upon successful completion, getStreamPosition() returns PTS of last video frame or audio sample (milliseconds). Provide the PTS of last played video frame or audio sample. Disconnect from server and destroy pipeline. Disconnect from network server, destroy pipeline, free all resources that were allocated on Open() call. Set mute and unmute on audio render. mute - true – audio is off , false – audio is on. Mute and unmute audio render. Return delay in milliseconds if input stream comes with some delay in case network bottleneck. Return bitrate of network input stream comes on device. Return stream bitrate in kbps. Return frame rate of downloaded stream so application can estimate if network bandwidth is enough for defined stream. Upon successful completion, GetStatFPS returns fps of network stream. It is frame rate of stream that is downloaded from network, otherwise -1 is returned. All errors are provided in callback status. Provide the frame rate of captured stream (download speed) to estimate if network speed is enough to playback stream in real time. Retrieve the name of file has been recording. Name and full path of last recorded file. Notifications CP_RECORD_STARTED and CP_RECORD_STOPPED are received when recording activities took place. In order to ensure what is latest file name has been recorded we’d better call RecordGetFileName(0) at CP_RECORD_STOPPED event, and RecordGetFileName(1) at CP_RECORD_STARTED event happen. Return statistics about recorded chunks. UpdateView Set video output mode for current player instance. UpdateView() function uses settings that are set in player config structure. Retrieves a count of subtitle tracks. Returns a count of available subtitle tracks. SubtitleGetCount() retrieves a number of subtitle tracks. It can be used when player is in opened state only (PlayerState.Opened) or after notification PlayerNotifyCodes. PLP_BUILD_SUCCESSFUL. Select a subtitle track to play. track_i – the number of selected track, the value must be in the range of value has been returned by SubtitleGetCount(). SubtitleSelect(track_i) can be used also before opening of the player. track_i value is saved automatically into MediaPlayerConfig.setSelectedSubtitle(). This track will actually used after calling Open. Retrieves a selected subtitle track. Number of selected subtitle track. SubtitleGetSelected() returns actually selected subtitle tack. In case player is not Opened state, SubtitleGetSelected() returns number that was set in config. Upon successful completion, returns 0. Otherwise –ERROR is returned. Function SubtitleSourceAdd adds a path to subtitle source. Application can set up multiple external subtitle sources. After adding subtitle source, the player will increase the count of subtitle tracks (SubtitleGetSelected) and select required track by SubtitleSelect call. SubtitleSourceAdd can be called in both before and after Open() call. Also these paths to external sources can be added through MediaPlayerConfig. subtitlePaths string list. Removes an external subtitle source has been added by SubtitleSourceAdd function. Get available directions for move mode. possible move 0 - nothing, 1 - to left, 2 - to right, 4 - to top, 8 - to bottom. Get view sizes and video aspects like video width/height, aspect calculations etc. audiodecoder_audiorenderer_size - buffer size between audio decoder and audio renderer. Raw video or audio data is provided if callback is defined on application level. First, MediaPlayerCallback should be added into protocol. There are following callback functions that can be defined in application. Return video frame received from the network source. format – video format. Video format is the same that is provided by server or file source. Upon successful completion, returns 0. Otherwise – ERROR is returned. Return audio sample received from the network source. format – audio format. Audio format is the same that is provided by server or file source. Return uncompressed frame received after decoder.